The stamp is a GWP from TAC Spring Summer 2008 catalog and was stamped with my Palette Noir ink onto a white card stock scrap I found in my stash edged with the Raw Sienna to match the other pieces and then adhered to the top . 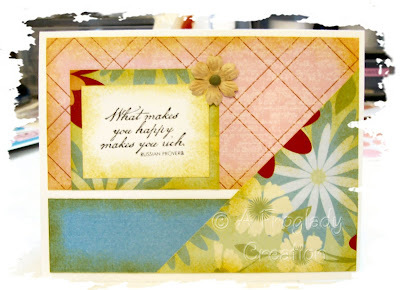 I added one tiny Prima flower with a brad center to the top right of the stamped sentiment and that was it on this one. I thought the patterned paper did enough for it. Doing this set was a real plus in the last few busy weeks as I could just grab a card, finish it off with a stamped sentiment and then go. I will be doing more of them! You really check out Pamela's tut and give it a try! Another place to check is SheetLoads which has a link in my sidebar!